Ever since we tried out the Deeper Smart Sonar Pro+ in one of the small dams at Delta Park to see how it worked, I’ve been dying to take it for a spin at my regular paddle spot – Emmarentia Dam, situated in one of Johannesburg’s oldest suburbs. Well, this last weekend I got my chance and was completely blown away with how simple it was to attach to a touring kayak and map the bottom of one of my favourite spots in Gauteng. As a member of the Dabulamanzi Canoe Club, I’m always swapping banter with the guys fishing along the banks of Emmarentia Dam as I complete my circuits. And I have to admit I get a wicked pleasure out of telling them where the fish are jumping (you always get to see the good spots when out on the water). That said, knowing both Deeper Smart Sonar models (the Pro and the GPS-enabled Pro+) feature boat modes, and that Deeper’s optional Flexible Arm Mount can fix these amazing, portable sonar units to just about anything, my curiosity was running rampant – I just had to see what was hiding beneath the surface. 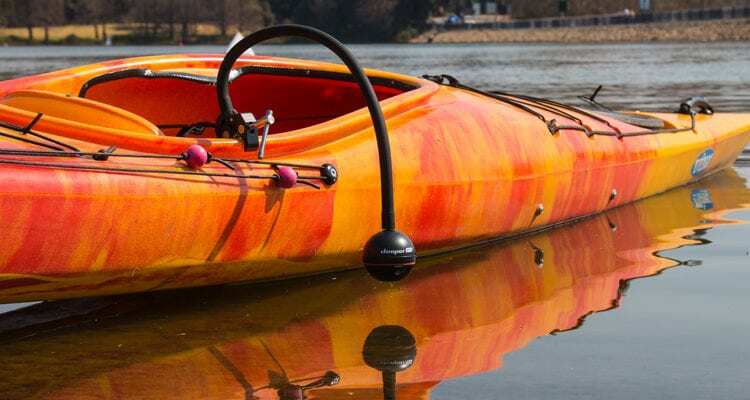 With that in mind, I headed straight to my trusty, can-do kayak guy – Chad Andrews, owner of Canoe Concepts – and borrowed a touring kayak from him for the weekend, figuring it would make an ideal platform to mount the Sonar Pro+ onto. I wasn’t mistaken. The Flexible Arm Mount attached really securely to the raised lip around the cockpit (which the spray skirt normally attaches to). Feeling optimistic, I fired up the Deeper Smart Sonar app on my smartphone, set it in Boat Mode, made sure I was using the unit’s more detailed 290 kHz narrow beam, and psyched myself up for paddling who knows how many circuits around the dam. Here’s what the Deeper Sonar app looks like on my phone after I mapped Emmarentia Dam. Note the red arrow that indicates my location, and the white lines that show my track through the water. The sonar image on the right corresponds with my location on the map. I knew I was going to have fun, no matter the results. But what really surprised me was how easy mapping the entire underwater profile of Emmarentia proved to be. Because I’d gone for the highest sonar setting that provides a more accurate 15-degree cone, I had no idea how many circuits I would have to paddle to get the job done. The surprising answer is only about four – or, more specifically, three full circuits with an erratic wiggle down the middle to fill in the few remaining blanks. (You can watch the map fill with info as you move over the water – so spotting where you missed is easy). In fact, the entire task took me just 87 minutes, with a fair chunk of that time taken up waiting for the radio controlled sailboat guys to finish their regatta so I could map their corner of the dam. And you know what? I’d hardly even worked up a sweat! Once back at the clubhouse, I dived into the history setting on the app to check out my handiwork. My phone’s screen was divided equally into two parts. The left side displays a map of the dam, showing the different coloured contour markings (indicating depths) and a white line denoting the exact track I paddled. There’s also a neat sliding scale that allows you to speed up or slow down the scanning animation in real time – which allows you to relive your mapping experience in its entirety, and a feature that I found a huge amount of fun. While that’s going on, the right half of the screen turns into a typical sonar display that mirrors what you see on the map – this time indicating depth, the ever-changing underwater profile, vegetation and… most importantly, fish! Here’s what Emmarentia Dam looks like when viewed on Deeper Sonar’s brand new Lakebook portal. Click the image below for high-res map data.